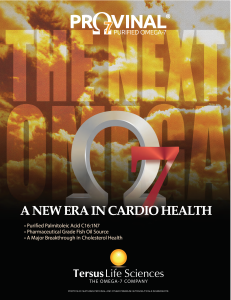 CLEVELAND, OHIO — December 16, 2012 — More than 100 million people in the U.S. who are at risk for heart disease caused by metabolic syndrome and inflammation can now take “Cardia 7”–a purified Omega 7 supplement that has been clinically shown to reduce C-reactive protein (CRP). The number one killer in the US — heart attacks — is no longer best predicted by cholesterol or triglycerides, but by inflammation which can be measured by C-reactive protein (CRP). It’s estimated that 2,200 people die every day from cardiovascular disease, and half of all heart attack victims who have low cholesterol levels never knew they were at risk. CRP is a general measure of inflammation in the body and the leading predictor of cardiovascular disease, better than cholesterol and/or triglycerides. For people who have elevated CRP, purified Omega 7 has been clinically shown to reduce CRP by up to 73%. It is also known to decrease insulin resistance, and decrease accumulation of bad fats in the liver — with no side effects. The clinical study in humans screened 30 test subjects who took one gel cap per day for a month. On average, taking one gel cap per day, the test lowered LDL cholesterol 11.2%, and for those with elevated baseline inflammation, C-reactive protein was reduced by an average of 73%. Michael F. Roizen, MD, is the Chief Wellness Officer and Chairman of The Wellness Institute at the Cleveland Clinic where he is striving to elevate preventive care and wellness to a driving role in medicine and society by radically improving health and decreasing wellness costs spiritually, physically and economically. Among Dr. Roizen’s many accomplishments, he co-founded six companies including RealAge sold to Hearst in 2007; co-invented a drug approved by the FDA in April 2008; co-wrote three medical bestsellers and four number one New York Times bestsellers (the YOU series books and RealAge) and formerly served as chair of a Food and Drug Administration advisory committee, as well as editor of six medical journals. He and Dr. Mehmet Oz co-write the daily “YOU Docs” columns syndicated to 76 newspapers in North America and similar columns in four magazines. Cardia 7 is manufactured by Tersus Life Sciences. Founded in Cleveland, Ohio in 2010, Tersus was recipient of Therapeutic Discovery Grant for Ground Breaking Medical Research in 2010. Contains Provinal™ Purified Omega 7 fatty acids are purified to express high levels (50% and upwards) of palmitoleic acid (C16:1n7). Future concentrations are projected to be 90% or more. Especially formulated to remove palmitic acid, a saturated fatty acid that has been shown to have toxic effects on pancreatic beta cells (the cells responsible for secreting insulin), leading to a greater chance for insulin resistance and subsequent development of diabetes.